More than a quarter of fatal road accidents are caused by drivers who have fallen asleep at the wheel, government figures suggest. The latest road casualty statistics from the Department for Transport show that drowsy drivers were to blame for 53 fatal and 351 serious crashes in 2017. However, the true figure for fatigue-related crashes is believed to be much higher due to under-reporting, with up to 25 per cent of fatal accidents estimated to have been caused by people who have dropped off driving. 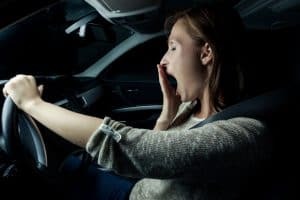 An online poll of 20,561 UK drivers in September found that one in eight (13 per cent) have fallen asleep at the wheel. In addition, close to two in five (37 per cent) admitted that they have been so tired they have been worried they would fall asleep when driving. Who is most likely to drive tired? Men were deemed to be three times as likely as women to say they have fallen asleep at the wheel (17 to five per cent). The research raised concern that young drivers, aged between 18 and 24, are the most at-risk. This group was found to be the most likely to say tiredness doesn’t affect their driving ability (13 per cent compared to two per cent of all drivers), as well as being the most likely age group to say they normally carry on driving if they feel tired (18 to three per cent). Close to three in five (57 per cent) stop for a break as soon as they realised they might be too tired to drive. This figure dropped to just 34 per cent for 18-24-year olds. One in ten (11 per cent) knew they were tired when they began their journey, increasing to 29 per cent for 18-24-year olds. When asked why they were so tired, almost two in five (39 per cent) said they’d had a hard day at work, while a third blamed the monotony of the journey. Around a quarter pinned their tiredness on trying to cover too much distance in one day and a lack of sleep the night before. Edmund King, AA Charitable Trust director, believes that drowsiness is one of the most underestimated risks on the roads. “Tiredness is a fact of life at some point for most of us and it is crucial we know how to manage it in relation to driving,” he commented.